Bug loves cursive. I started teaching him a couple months ago when he decided he wanted to be able to sign his own passport and “other super important papers, and give autographs!” Even though he is young, I thought there is never a better time to teach cursive than when he WANTS to learn. I was thrilled to be given a copy of Classical Conversations’ PreScripts Cursive Sentences and Art Lessons to use with Bug and keep up the excitement of learning cursive. 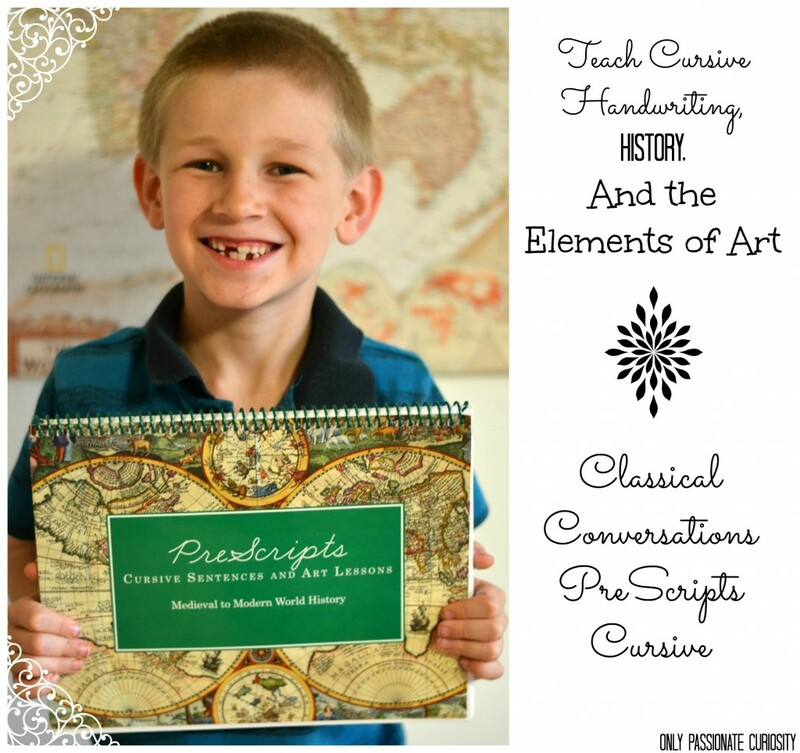 The PreScripts program from classical conversations is a full cursive program starting with learning to write letters, to writing passages in cursive. I received the third book in the series, Cursive Sentences and Art Lessons, which are based on history, the Medieval to Modern World History. Cursive sentences and Art Lessons contains history sentences and art lessons from Medieval to Modern World History. Each Sentence is traced, then written twice. The program includes built in review of the history facts, so not only is the child learning cursive, they also are memorizing the history facts. The art instruction is relevant, in that it shared historical works and maps, but the instruction was detailed and very, very good. In this book, kids are taught techniques for imitating art- by using grids and mapping. They are also taught about the elements and principles of art- things like patterning, perspective, the rule of thirds, shadowing, drawing figures, technical drawing, and so much more. I felt like this book could be easily used for a yearlong art curriculum in teaching drawing skills. I found the history sentences to be detailed enough to be valuable, but short enough for Bug to use them as memorization work on top of cursive practice. This book went along really well with our Middle Ages study, and still has a lot of sentences for modern times left for us to do! Bug loved that about once a week, his cursive writing time was used for drawing and art instruction. He really enjoyed drawing, and I enjoyed the in-depth instruction provided in the elements of art! The only element we struggled with is the size of the lines provided to write on. Bug, being on the young end of the recommended 7-12 age range, struggled with being able to write small enough to fit the whole sentence on the line. There is no give in how large the child writes, so Bug instead just wrote as much of the sentence as he could possibly fit on the line, and then missed writing the rest. It wasn’t ideal, but I figure as he practices, he will get better at writing small and be able to write the whole passage correctly. I also think it’s important to note that the copyright allows for copying of the pages for use within your family- which means that while Bug is writing too large now to fit on the line, it’s not a terribly big deal, because he was writing on a copy instead of the original. I can make copies of one page, and allow him to practice and make mistakes, and work through it- and THEN once he has it down, write in the book. 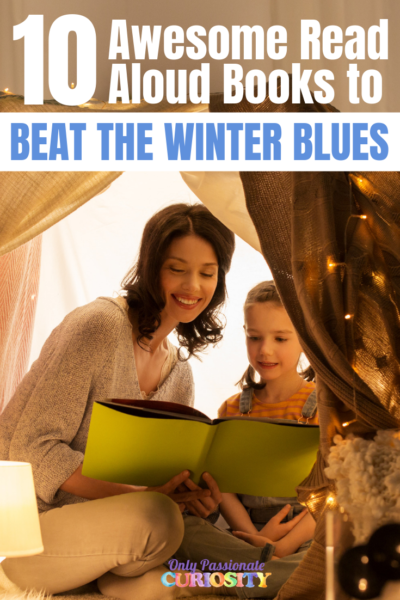 You could also use this one book with ALL your children, making the purchase more than worth it in the long run. The final book in the series contains copy work from famous American documents and speeches, and I am for sure picking this one up to go along with our American History studies in the future. I really can’t think of any reason NOT to use this cursive program if you’re a classical homeschooler. 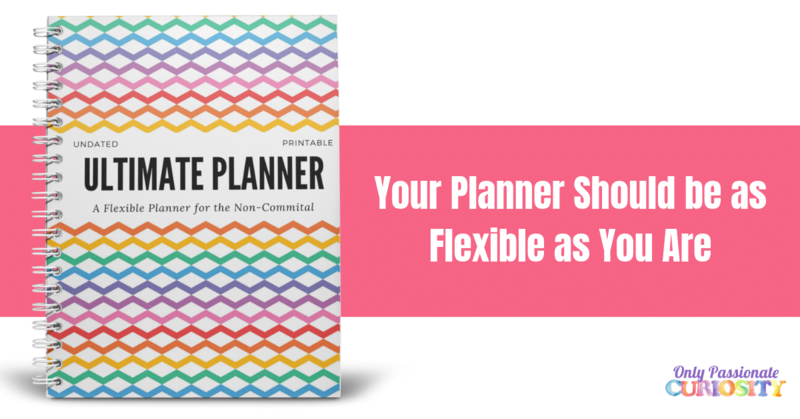 Classical Conversations PreScripts cursive is a time saver and multi-tasker. Not only does it give the child ample cursive practice, it includes history selections to reinforce your studies, and art lessons that rival any art curriculum. 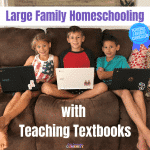 While the second book in the series is scripture based, this book, Cursive Sentences and Art Lessons, is appropriate for secular Homeschoolers and Christian Homeschoolers alike. 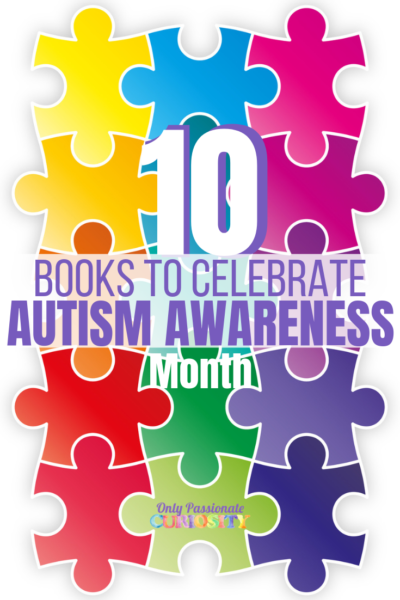 This book is advertised for children ages 7-12, but requires the child to write very small, so it may be more appropriate for slightly older students, or children with strong fine motor skills. Other Crew Members tried all 4 levels of the PreScript program- click the link below to read about their experiences! Classical Conversations PreScripts Cursive Sentences and Art Lessons is available for 12.99. « Learn about the Water Cycle: Make a Terrarium! Can you tell me how many pages or lessons are in each book? Is it a full year of handwriting practice? The book’s intro states if you do about one page a day, there is enough for a full school year. Its in the room right now with a sleeping child, but tomorrow I will see if the pages are numbered. That description sounds about right to me- I am 99.9 percent sure it will last our family a full year following the one page a day rule. Ok, I only needed an estimate. 🙂 It’s a good price for a full year, and the book looked thin to me, so I just wanted to confirm.